This year’s conference features a number of guest presenters and workshop leaders. Professor John Skelton will be hosting a workshop with Katharine Heathcock (see below) of Birmingham University Medical School on conducting roleplay in the medical communication classroom. 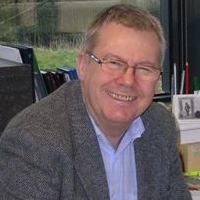 Professor John Skelton worked in ELT/ESP, and then as an academic applied linguist, for many years. Since 1992 he has worked exclusively in Academic Medicine at Birmingham University Medical School, where he is Professor of Clinical Communication. He is co-founder of the Interactive Studies Unit, which teaches aspects of communication and professional development to thousands of healthcare professionals and students each year. He is also Lead for Education Quality for all Birmingham healthcare courses, and therefore responsible for their quality management to the General Medical Council and other Regulatory Boards. He is the author of two books on clinical communication, and has had original research published in journals as diverse as Applied Linguistics, The Lancet and The British Medical Journal. He was awarded Membership of the Royal College of General Practitioners (MRCGP) in 2002, and in 2016 became one of the few non-clinicians ever to be awarded FRCGP (Hon), i.e. Honorary Fellowship of the College. Katharine Heathcock will be running a workshop with Professor John Skelton on conducting roleplay in the medical communication classroom. Katharine Heathcock is a full time Teaching Fellow for the College of MDS, teaching Clinical Communication across the MBChB, Pharmacy and Dentistry courses, with responsibility for MBChB years 1 and 2 and GEC. She also teaches at postgraduate level. Katharine has experience as a coach facilitator on the Referred Student programme. She is a Personal Mentor and has responsibility for academic programming for the Biomedical Science International Summer School. She has a background in theatre, professional role play, training and assessment but her passion is teaching. Robin Walker will be leading a workshop on the teaching of pronunciation of English as a lingua franca for healthcare workers. Robin Walker has been in ELT since 1981, working as a teacher, trainer, materials writer, and consultant. He regularly collaborates with Trinity College London, Oxford University Press and local government education authorities in Spain. He has published numerous articles on pronunciation, and is author of the ESP course Oxford English for Careers: Tourism, and of Teaching the Pronunciation of English as a Lingua Franca, both with Oxford University Press. Robin is a committee member of the IATEFL Pronunciation Special Interest Group, and of the Oxford University Press Expert Panel for the teaching of pronunciation to the 21st-century learner.